Milan 2016: Dutch designer Bertjan Pot has created a colourful textile to upholster Cassina's Utrecht armchair, designed by Gerrit Rietveld in 1935. The Utrecht armchair has been exclusively produced by Italian brand Cassina since 1988, and has become one of the brand's most iconic products. 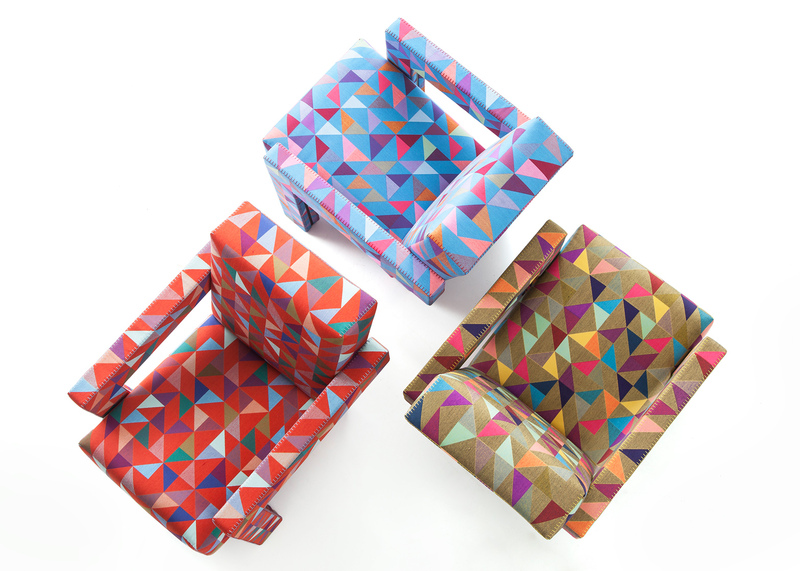 Each of the three versions of Pot's BoxBlocks fabric will cover 90 limited-edition chairs. The colourful geometric-patterned material is made using innovative weaving technology. Using a computer-controlled Jacquard weaving machine, eight coloured threads are mixed two at a time to create 19 different colours on a template outlining the shape of the armchair. The result is a unique geometric pattern in which the combination of triangles is never repeated. "My concepts are never single-lined or step by step but they are always a meeting point of different ideas and feelings," said Pot, who has previously designed products for Moooi and Arco. "For the BoxBlocks textile of the Utrecht it was important for me to do something today that was not technically possible at the time of the armchair's creation." When designing the pattern, Pot was inspired by the shape of the chair itself, which he described as "block-sculptural". "The pattern is inspired by the Modernist block-sculptural shape of the chair itself," he continued. "When talking patterns there are generally two types, one is the pattern that respects the product and enhances its shape – think traditional tartan checks and stripes – the other is the pattern that crosses seams and dazzles its actual shape – think zebra stripes and large organic flower prints. This one does both." Gerrit Rietveld was a Dutch architect and furniture designer, and a principal member of the De Stijl artistic movement in the early 20th century. His most famous works include the 1924 Schröder House in Utrecht, as well as the Steltman and Zig-Zag chairs. Pot's BoxBlock updates of the Utrecht armchair is part of Cassina's first collection under the direction of Spanish designer Patricia Urquiola, which also includes pieces by Philippe Starck, Ora Ïto and the late Zaha Hadid. Urquiola – who took over as art director at Cassina in September last year – described the brand's 2016 Origins of the Future collection as an "evolution and exploration". "This year we were going to have new dialogues with the 90th anniversary, and I wanted to arrive in a strong way," she told Dezeen at this year's Salone del Mobile furniture fair, where the collection made its debut. It is the first time that Pot has worked with the Italian brand, and Urquiola said that collaborating with new designers is part of her strategy as art director for Cassina. "I want to remind people that we are working with people who explore many arguments and many materials, and have an experimental attitude," Urquiola added. "I want to go on connecting the new relations with the new designers." Cassina's Origins of the Future collection was on show at the Salone del Mobile furniture fair in Milan from 12 to 17 April. 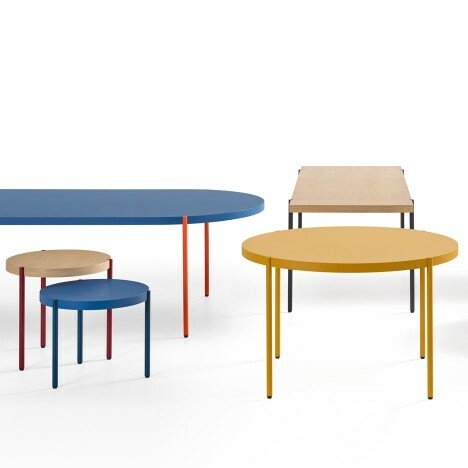 Other pieces that launched at the fair included a set of tables referencing Minimalist sculpture by Swedish studio Claesson Koivisto Rune, and a range of desks by London studio Industrial Facility based on park benches.